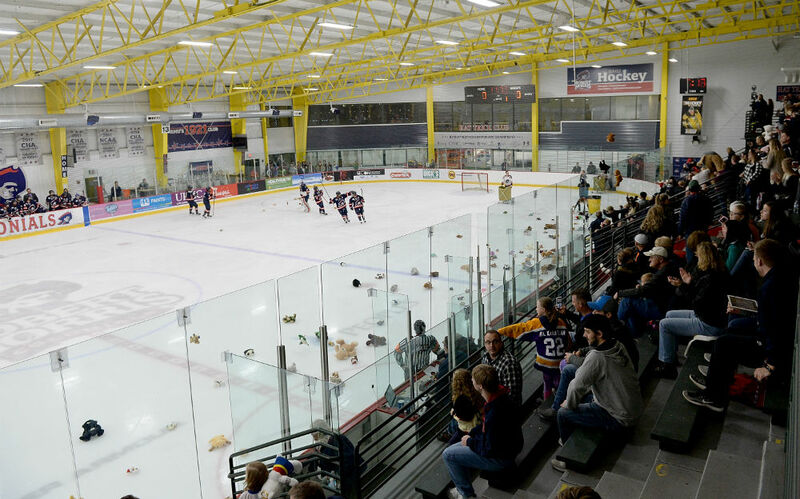 The first time the Robert Morris women’s hockey team held its annual Teddy Bear Toss game in 2016-17, it took a while for the bears to all rain down. The Colonials were held off the board until the third period. “Stress like crazy” is what defender Maggie LaGue remembers from that game. While a lot of college athletic events are organized by the schools and athletics department staff, the Colonials’ women’s hockey team has a cool tradition going. Since its inception three seasons ago, the responsibility of organizing the Teddy Bear Toss falls on the senior class, with players tasked with spreading the word and coordinating with the beneficiaries of the event. LaGue, a senior captain, was the point person for this year’s Teddy Bear Toss game. “It’s a great project and I think they gain not only experience in terms of doing this sort of thing, but they also gain the appreciation for what they’ve done, and where this money and where these teddy bears can actually benefit people,” Robert Morris head coach Paul Colontino said. For the first two years, the Colonials’ Teddy Bear Toss benefited the UPMC Children’s Hospital of Pittsburgh, specifically patients within the pediatric oncology department. LaGue and her fellow seniors decided to change things up this year by getting the Autism Society of Pittsburgh involved. When she reached out to the Autism Society of Pittsburgh, she said that as huge hockey fans, they were “100% on board” with participating in the Teddy Bear Toss. For that reason, LaGue wanted to involve them in the game’s festivities, too. 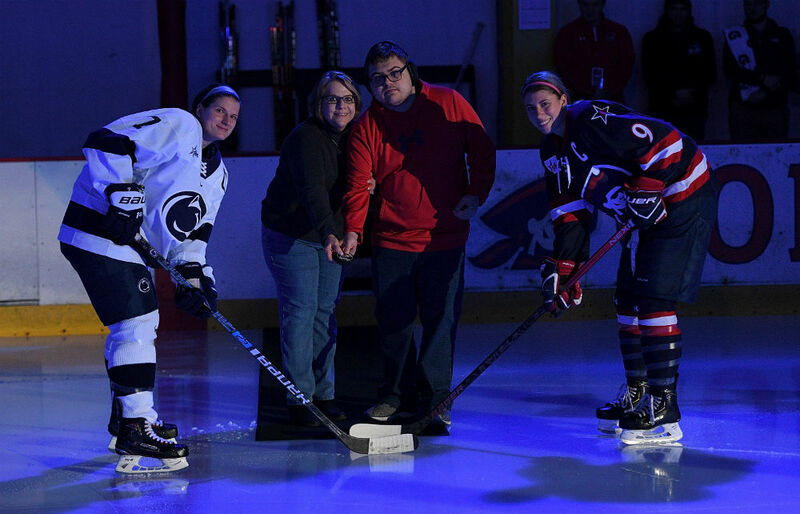 Mary Ellen Greacen, the Director of Operations at the Autism Society of Pittsburgh, and her son, Alec, who is on the autism spectrum, participated in the ceremonial puck drop before the game. “I definitely wanted Mary Ellen to be involved just because she does so much with that organization; she really runs the show over there,” LaGue said. “And she told me that she has a son that’s affected by autism and that he’s a huge hockey fan, so it just seemed like it was meant to be, that they were there. LaGue credited her fellow seniors and teammates for helping to organize the Teddy Bear Toss, calling it a team effort. While they certainly had the support of the Robert Morris coaching staff, the fact that the event is almost completely in the hands of the players is by design. When LaGue decided on Robert Morris as a college recruit, she said she was looking for a school that wasn’t too far from her home state of Vermont, but with enough space that she could “do her own thing”. The opportunity to take charge of the Teddy Bear Toss and give back to the community is just one way she’s carved out some space of her own as a leader since coming to campus. LaGue is majoring in finance, with a minor in accounting. She’s also involved with the Colonial Leadership Academy, a student life organization that’s made up of student-athletes at Robert Morris. Colontino said that LaGue’s handling of the Teddy Bear Toss just exemplifies the kind of leader that she is for the Colonials. She’s the type of player who plays hard no matter the circumstances, never offering up excuses and leading by example for the rest of her team. “When you look at Maggie and what she does on the ice and what she does off the ice, you can’t help but be inspired to do the right thing,” he said. “First and foremost, she’s just a fantastic person. She’s got great character, great values, great moral ethics. She’s one of our captains for obviously those reasons. For LaGue personally, the Teddy Bear Toss was a big game. Along with watching her hard work and planning come to fruition, she hit a historic milestone on the ice. With two helpers on the night, she tied Thea Imbrogno, ’14, for second all-time in assists in program history. She has since passed Imbrogno to take sole possession of second place in the Robert Morris history books. LaGue credits her teammates for finishing off so many plays over the years, but the accomplishment is also a testament to her ability to get involved in the offense all four years with the Colonials. She’s not the only big-time contributor on the back-end for Robert Morris. The Colonials have almost an embarrassment of riches as far as two-way defenders go. LaGue is fourth on the team with 15 points, but she’s also blocked 56 shots. Sophomore Emily Curlett is right behind her with 11 points, and leads the team with 94 blocks. Senior Kirsten Welsh, the reigning College Hockey America Defender of the Year, rounds out the top six in scoring on the squad with 10 points. The Colonials won last year’s CHA regular season championship but were eliminated in the conference postseason tournament by eventual champion Mercyhurst. LaGue’s favorite memory with Robert Morris was winning the CHA Tournament back in 2017. Sitting in first place in the conference standings once again, it’s a feat the team would like to repeat again this year.